Among America’s amazing pantheon of founders, Patrick Henry stands out for his stirring speeches and fervent commitment to liberty, virtue, and small government. The Virginia planter, lawyer, and politician strongly denounced Great Britain’s political and economic control of the American colonies and played a leading role in the movement for independence. More controversially, Henry’s love of liberty, coupled with his support for limited government and states’ rights, led him to oppose ratification of the U.S. Constitution. Henry’s actions were inspired both by his devout Christian faith and the civic spirit of the ancient Romans and Greeks. Although 10 previous biographies of Henry have been penned, Thomas S. Kidd’s Patrick Henry: First Among Patriots offers a fresh and compelling portrait of one of our nation’s more renowned but seemingly enigmatic founders. Dispelling many misconceptions, Kidd carefully analyzes the Virginian’s core convictions and contradictions. Kidd also illuminates the key ideological struggles of the turbulent revolutionary era involving the battle for independence, the debate over religious disestablishment, the creation of the United States, and the practice of slavery. 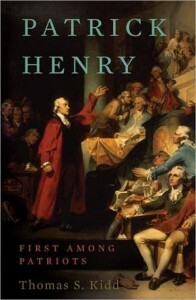 Most Americans associate Henry primarily with his electrifying speech at St. John’s Church in Richmond in 1775. Opposing those who called for reconciliation with England, Henry thundered, “Is life so dear, or peace so sweet, as to be purchased at the price of chains and slavery? … I know not what course others may take, but as for me, give me liberty, or give me death!” However, Henry’s fiery rhetoric was only one of his many contributions to American independence and development. Few other founders were as revered during their lifetimes as Henry. Tremendously popular in his home state, he served six terms as governor and represented Virginia at the state convention to consider ratification of the Constitution. Honored as “an exemplar of virtue” and a senior statesman, Henry declined George Washington’s offers to serve as a senator from Virginia (to replace James Monroe, who had become an envoy), ambassador to Spain, secretary of state, and chief justice of the Supreme Court. Because of his family responsibilities, financial struggles, and health problems, Henry also resisted Federalists’ requests that he run for president in 1796. Despite Henry’s constant exhortations on civic virtue and his generally laudable personal morality, like other founders, his ethical conduct was far from spotless. After the Revolution, Henry urged Americans to repudiate their debts to the British. As a lawyer, he frequently defended clients whose cases were ethically questionable. As a government official, Henry sometimes supported legislation that aided his extensive land speculation in the West. More grievously, despite his numerous denunciations of the evils of slavery, Henry, like many other founders, continued to own slaves (67 at his death) and did not free them either during his lifetime or in his will. Second, Kidd contends that no one deserves more credit for the colonies’ revolt against England than Henry. In my judgment, the contributions of Samuel Adams exceeded Henry’s. The man from Massachusetts did more than the Virginian to publicize colonists’ grievances, defend their rights, and mobilize them to protest English policies. Interestingly, these two champions of American independence both served as governors of their respective states, were deeply committed Christians, constantly warned that the new republic could succeed only if its citizens were virtuous, and spent much of their adult lives trying to avoid or escape debt. Anyone wanting a better understanding of the many significant contributions Patrick Henry made to American history should read Kidd’s masterful biography.